Just returned from Iceland and my husband and I wanted to know what inspired us to go. Very small city with not much to do. Landmarks are far between. The people enjoying it most were from out west and love to hike between all the landmarks or stay on a sheep farm. Yuck. I have been throughout the west, Alaska and Canada and can't figure out why inspired me to go to Iceland. No nightlife, museums are small, the Arts Festival venues didn't seem to have anything going on once we trekked to get there. The restaurants are so expensive that we didn't eat out once. $50 for hamburger, $25 for kids fish and chips. We drove to Costco and had a hot dog and pizza. Shops are full of trinkets and souveniers. A small stuffed puffin was $35. People that are getting those cheap fairs will be shocked when they buy their first coffee or beer..
Stay home and find some other place to visit. Honestly I agree, if you want to stay only in Reykjavik, go to 2nd-rate museums, and eat hamburgers and pizza you would be better off staying home. You've accurately described the dark side of Iceland and I felt mostly the same way about Reykjavik. But there is so, so much more to the country. If you're a person who enjoys being in nature it's practically a wonderland between the waterfalls, glaciers, volcanos, and easy access to camping. As for restaurant recommendations, I can recommend the Höfnin restaurant near the harbor. We spent about $65 for the two of us, with beer, and I thought both the food and service were excellent. Totally agree with _kurt. I've had good $15 hamburgers in Iceland, but REALLY good $20 Arctic Char and other local treats. And very few folks go to Iceland for the museums. You go there for the incredible natural vistas like waterfalls, glaciers, volcanoes, etc. And I don't know of anyone who stayed on a sheep farm! As a native Icelander I really wouldn't recommend going far out of your way just to visit Reykjavík. Sure, check out the city for a day if you are passing through but it really doesn't offer much of interest in my view. Iceland is about exploring the natural sights. JDiver and mphall like this. The way to eat in Iceland for less $$ is to hit the grocery stores (Bonus, with the big pig on the sign) and stock up there, along with the bakeries that are all over the place. Our lunch every day was sandwiches that we made with bread from the bakeries and cheese and meat from the grocery store, along with dried fruit/nuts we brought from home (Trader Joes, if you have that). Dinner can be done cheaper if you don't mind a premade sandwich from the convenience stores/markets at the gas stations in the smaller towns, or share a pizza ($25-$30), or the great Icelandic hot dogs can suffice now and then (they really are very good). This is what we are looking to do. Take some food with us, and buy fresh stuff there. The only issue we might run into is the opening hours of the supermarkets and not being able to get to them on the days we'll be taking tours (decided against the Ring Road tour). Heck, we're also going to BYOBing! I realize that Iceland is expensive but surely for all the tourists there, someone might have found a few bargains. Maybe a museum cafe or less touristy part of town? Any thoughts are appreciated. Iceland is really really expensive and I think the US and Canada can't be beat for natural beauty. I wish I had saved my money and just gone for a weekend to see the Northern Lights and skipped the rest. If you're thinking about going to Iceland, check some other destination off your list first. It's an icy island and any food or supplies are very expensive. The fish is quite fishy because of the cold icy waters. It's not like Alaskan salmon. Museums all charged admission and a drink and sharing a sandwich was about $40. Crazy. Er, Arctic char is local, fairly common and a typically salmonid fish. Tastes something like between trout and a milder salmon, like King. Quite like Alaskan Arctic char or mild salmon. Ubiquitous cod is hardly “fishy” if it’s fresh. Plaice is common, and delicately flavored. Icelandic lamb is among the best. Goose and game are not uncommon. But yes, it’s pricey. And strikingly beautiful, with glaciers, fjords, thermal areas and baths, clear streams and bountiful waterfalls, and the opportunity to walk down (or snorkel or scuba the Silfra lake) the rift that splits the American and European tectonic plates (not to mention the site of the Althing, the prototypical parliament). Wait until you are over 67 and you will enjoy free admission to some museums in Reykjavik. South of Reykjavik, if you’re renting a car at KEF ideal to stop en route to Reykjavik. Or starting out southbound on the Ring Road. Near our hotel (Konsulat) and the harbor, some options... including a Delicatessen. Some are more informal. The Sea Baron / Saegrefinn is lobster soup or skewers of various kinds of fish and produce. Wow! I’ve been to all of them with the exception of Sægreifinn. I was going there with some people from a recent Greenland tour but our flight was delayed and it didn’t work out. Other cheaper places I’ve been to include Café Loki by Hallgrimskirkja and Icelandic Street Food on Lækjargata. Minke whale. Usually consumed as steak from the grill. Tamer Icelandic specialties like kjötsupá (lamb meat soup) and plokkfiskur (haddock, potatoes, white sauce and onion), rye ice cream, etc. are available too. Icelandic lamb is among the best, and the Icelanders certainly know how to make the most of any fish. Langoustine and sesafood soups are typical as well. Loki is a centrally located tourist place frequented by Icelanders craving reasonably priced local food. I’ll be noshing there again in a few days. For other local food, see the article by ViaHero here. Also, ost restaurants seem to offer vegetarian fare, and a few vegan fare. Tamer Icelandic specialties like kjötsupá (lamb meat soup) and plokkfiskur (haddock, potatoes, white sauce and onion), rye ice cream, etc. are available too. 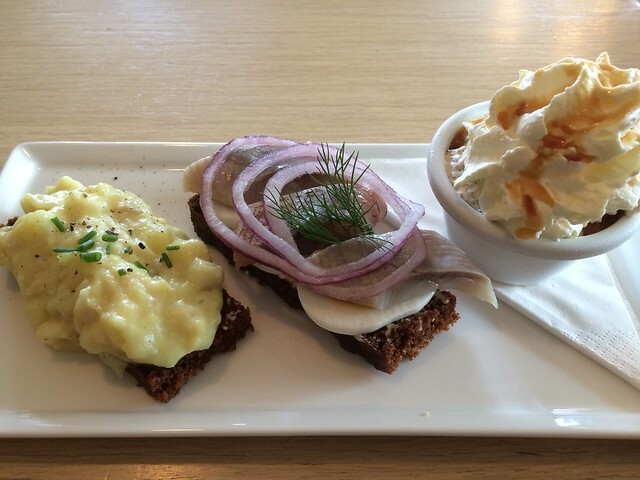 I've opted for tamer Icelandic specialities (Icelandic Plate - Baldur) of rye bread slices with mashed fish and egg & herring, plus rye bread ice cream. Dill is the Michelin-starred restaurant. It's quite good and relatively reasonable given the quality. It may seem odd to have Mexican food in Reykjavik, and yet Burro, a relatively new restaurant, is quite good. Good cocktail bar - Pablo Diskotek? - above. Reykjavik has a strong indie music and craft beer culture. There's some good food at places that combine those. Mikkeller, of course, has a great assortment of beer and in Reykjavik they have pizza crafted by the Dill folks. Many places have happy hours. There is an app for that you can get. Getting outside Reykjavik, choices become more limited so it can be good to have snacks or sandwich items. Nóatún is the grocery I preferred as they have a lot of specialty items, decent produce and bakery. They also have freshly prepared food at lunch for reasonable prices. Other grocery stores are less expensive, but lesser offerings. Link to a good list of casual restaurants in Reykjavik posted on June 8, 2018 by Auður, a resident of Reykjavik, on her blog I Heart Reykjavík. All times are GMT -6. The time now is 4:38 am.